What if we told you that you can throw a truly delicious vegan brunch that will please every kind of eater? With egg, meat, and dairy-free pancakes, quiche, biscuits, home fries, and more, you can! Mix and match these dishes to make an ultimate brunch menu. If you can't decide, start with avocado toast and chia seed pudding or breakfast burritos and fruit salad, and you really can't go wrong. Quiche is a classic brunch dish, but since it is an egg dish it's usually excluded from vegan meals. 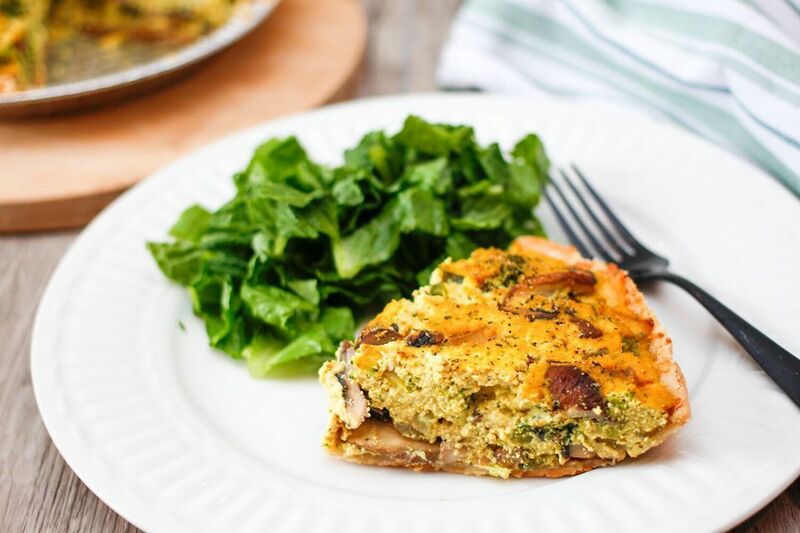 This version uses firm tofu in place of eggs, imitating the texture that quiche is known for, and a vegan crust. Mushrooms, broccoli, and bell pepper add color and flavor—swap out your favorite veggies to suit your tastes. With this low-fat vegan recipe, waffles are a treat without the guilt. A mix of white and whole wheat flour increases fiber, and a little applesauce stands in to moisten the batter instead of butter or oil. Grease your waffle iron well so the waffles don't get stuck. Top with syrup, berries, and coconut whipped cream for an extra-special brunch. You only need a few ingredients to make The Ultimate Avocado Toast, the choice of city brunchers everywhere. Since there are only a few ingredients, be sure to use high-quality, fresh bread (vegan, of course) and perfectly ripe avocados. Prep these at the last minute so the avocado doesn't turn brown. Banana bread is always a crowd-pleaser, and it's easy to make. Really ripe bananas are the key to good flavor and texture—don't be scared to let them turn totally brown. You can bake this bread the day before to save time if you're playing host. One of the best things about brunch is how it tows the line between breakfast and brunch. Want a side of pancakes with your burger? You got it! If you're feeling more like lunch than breakfast, try these Vegan Mushroom Bean Burgers. They have a nice, meaty texture and you can mix up the toppings. It can be hard to put together a brunch menu without eggs, but luckily tofu can effortlessly play the part. A few spices and diced vegetables add flavor, and the texture is soft and egg-like. Add ground turmeric for a yellow color. 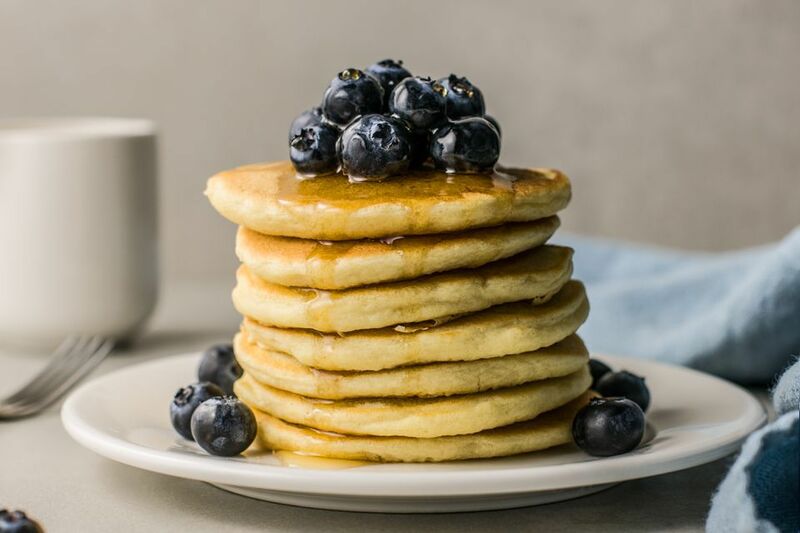 Vegan pancakes are just as easy to make as regular pancakes, and just as delicious, too. Use almond milk (or another non-dairy option) instead of regular milk. This batter is ready for the griddle in less than five minutes. Serve topped with fruit or put blueberries right into the batter. Andrew Unangst / Getty Images. Combine tropical fruits like mango, kiwi, and papaya with banana, grapes, and berries for a fruit salad full of textures and flavors. A light dressing of coconut milk, lime juice, and sugar adds just enough sweetness. Serve this as a side with pretty much any brunch dish. Lauri Patterson / Getty Images. Fresh biscuits are an excellent addition to any brunch menu, and this vegan recipe takes just a few minutes before it's ready to slide into the oven. Serve these biscuits warm with vegan margarine and jam or marmalade made with vegan sugar. To make vegan French toast, this recipe replaces the eggs with blended ripe bananas. The fruit gives the dish a lightly sweet flavor that might remind you of banana bread. Fried in vegan butter, this dish will be the star of the show. Carin Krasner / Getty Images. For a hearty brunch that'll stick with you, make breakfast burritos. Packed with tofu, mushrooms, peppers, and tomato, they're healthy but satisfying. Add extra toppings like beans, hash browns, vegan cheese, avocado, or salsa if desired. Go all out with your next brunch and make this vegan challah bread. It takes a little planning, but the result is a lightly sweet, soft, and crusty bread that's worth every minute. Serve as a side dish or turn into French toast. Studio Six / Stocksy United. Vegan potato pancakes might sound impossible, but a simple mix of ground flaxseed and water magically holds these crispy latkes together. Instead of spending time and effort frying them, just bake them, flipping halfway through. Serve as a potato side dish or topped with applesauce and vegan sour cream. These fluffy pumpkin muffins are made with whole wheat flour and sweetened with maple syrup, making them a healthy way to start your day. Add in a couple handfuls of nuts, seeds, and/or dried fruit to add texture. If you have leftovers, these muffins freeze well, too. No brunch is complete without a side of potatoes. These Skillet Fried Potatoes are exactly what you want next to your tofu scramble or breakfast burrito. A simple combo of diced potatoes, peppers, onion, and garlic is perfectly crispy with just the right amount of spice. Matilda Delves / Getty Images. Looking for a refreshing alternative to oatmeal? Make chia seed pudding. The tiny seeds plump when soaked in liquid, creating a pudding consistency without any need for eggs or dairy. Sweet dates and cinnamon flavor this recipe, which sits overnight in the fridge before serving.